Ground heat pumps take natural energy from the earth and convert it into usable heat for your home’s central heating and hot water supply. 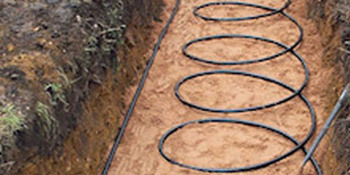 Ground source heat pumps are installed in your back garden, with pipes running underground. They work by circulating water and antifreeze around a loop of piping, absorbing heat and sending it to the exchanger. As ground heat has a stable temperature, the system will generate free energy throughout the year. The pipe’s length will depend on the size of system you opt for, and longer loops will draw more heat from the ground. Cut your home’s carbon footprint by utilising a natural, environmentally friendly source of energy. Whilst air source heat pumps tend to be much easier to install as they needn’t be in the ground, they are less efficient than the geothermal heat pumps. Ground source heat pumps will cost anywhere between £9,000 and £17,000 depending on the size of system you’re after. This is why it’s so important to receive more than one quote to compare costs and ensure to get the right price. Of course, this would depend on what the geothermal pump will be replacing – oil, gas or electricity. The heat pump is powered by electricity but this is considerably less than what you’ll be saving with a renewable product. The efficiency of your old heating system will have a huge impact on how much you save with a heat pump. Old, inefficient boilers can work at just 70%, adding hundreds of pounds to your yearly bills. Geothermal heat pumps will come with a control system to help to accurately distribute heat at the right temperature. The heat pump installer will discuss everything you need to know before the installation goes ahead. Ground source heat pumps are one of the best ways to slash bills and make your home environmentally friendly. For up to four FREE heat pump quotes, simply complete our quick form and we’ll provide you with vetted and reputable installers in your area. Project: Enquirer: Property Owner General information: Ground heat source pump. Homes are given an energy ranking dependent on just how efficient they are and ratings are presented in the information below. This varies from A, by far the most energy efficient, to G, the very least efficient. With a higher rating you're more likely to have less costly energy bills as more heat will probably be retained in your house. You'll be able to increase your home's efficiency with insulation including double glazing, loft lagging or wall cavity insulation. There are many different types of home in the UK and the information underneath shows the type of houses in Uk. Throughout the country the most popular housing types tend to be semi-detached and terraced housing, but detached homes, flats and bungalows are also available. The pie chart beneath shows the proportion of houses in Uk that are central heated and non-central heated. Central heating figures within the the vast majority of UK properties, including those on the gas grid and houses heated by oil and electric. The information below shows the spread of houses heated up by various fuels. Throughout the UK the most frequent hands down are gas heated houses, followed by electricity and then oil. Biomass boilers are also increasing in popularity, heated by sustainable products such as wood pellets or agricultural waste.|Houses in the UK are heated up by a variety of fuels, which include gas, electricity, oil, solid fuel and LPG boilers. Each fuel has a varying cost associated with it so you could find yourself with more affordable energy bills by switching how your household is heated. Even solar thermal panels are being considered by many in order to lower heating bills for the years to come.